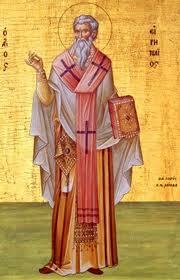 St. Irenaeus, Bishop of Lyons (2nd century C.E. – c. 202) was a stud for many reasons. First off, he was a theological beast. His multi-volume defense of the faith against the Gnostic teachers, Against Heresies, was probably the first real biblical theology in the post-Apostolic period and has deeply influenced Christianity, both East and West, ever since. Aside from his theological beastliness, he stands out when it comes to faithfulness in ministry, taking up his bishopric right after the last bishop got martyred. In the beginning, therefore, did God form Adam, not as if He stood in need of man, but that He might have [some one] upon whom to confer His benefits. For not alone antecedently to Adam, but also before all creation, the Word glorified His Father, remaining in Him; and was Himself glorified by the Father, as He did Himself declare, “Father, glorify Thou Me with the glory which I had with Thee before the world was.”(John 17:5) Nor did He stand in need of our service when He ordered us to follow Him; but He thus bestowed salvation upon ourselves. Wherefore also did the Lord say to His disciples, “Ye have not chosen Me, but I have chosen you;” (John 15:16) indicating that they did not glorify Him when they followed Him; but that, in following the Son of God, they were glorified by Him. And again, “I will, that where I am, there they also may be, that they may behold My glory;” (John 17:24). not vainly boasting because of this, but desiring that His disciples should share in His glory: of whom Isaiah also says, “I will bring thy seed from the east, and will gather thee from the west; and I will say to the north, Give up; and to the south, Keep not back: bring My sons from far, and My daughters from the ends of the earth; all, as many as have been called in My name: for in My glory I have prepared, and formed, and made him.” (Isa. 43:5). Inasmuch as then, “wheresoever the carcase is, there shall also the eagles be gathered together,” (Matt. 24:28) we do participate in the glory of the Lord, who has both formed us, and prepared us for this, that, when we are with Him, we may partake of His glory. -ibid. God wants us to obey him because through obedience, we are conformed more and more to the image of his glorious Son. Jesus is inviting us to glorify God so that we might participate in his own glory. The point is, God doesn’t need our obedience due to some lack in himself (even though he righteously demands it and we owe it to him), but part of why he desires it is so that we might gain from it. He’s like a dad telling you to practice some sport, or some instrument, not because he’s going to personally gain from it so much, but because he knows you will. The glory, the beauty, the greatness that will follow that obedience, that discipline, no matter how difficult, is worth it and it is the aim of our God in his commands to us. Once again, Ireneaus knew what so many of us don’t: We need our obedience far more than God does. ← Were the Westminster Theologians “Proof-texting”? Exactly. When we understand that the holiness God demands from us is for our sake and not His, then the stumbling block of God as the emotionally needy dictator goes away. Of course, if you follow Irenaeus’ logic, I imagine you’re going to end up with a consequentialist theology of punishment (I may have just made up a word) in which God *allows* us to reap what we sow (Galatians 6:7-8) rather than *imposing* a causally unrelated punitive response to our disobedience. 1. Scripture often does depict God imposing causally unrelated punitive responses. Think the plagues on Egypt, Sodom, the ground opening up to swallow Korah and his 250 followers, the plague after David’s census, etc. The strictly causal model doesn’t account for vast swathes of the biblical data, or narrative portrayal of God’s actions. Again, I think it’s a both/and, not an either/or.